Initially afraid to take on cases more serious than simple fever, he claims to have cured at least 3,000, including cancer victims, since he heard: “Ituloy mo, kung lubos ang paniniwala mo, andito lang kami (Just proceed. If your faith is robust, we will be here to guide you)." Anacleto says he usually hears the voice of the late Ruben Ecleo Sr, who founded the Philippine Benevolent Missionaries Association (PBMA) in the early 1960s. Called the "Divine Master" by his followers, Ecleo saw PBMA’s membership grow as he supposedly healed more people and transferred to them his healing powers. By 1967, he started using that influence to break himself into the political scene. He was elected mayor of Dinagat, one of the towns that would comprise the province of Dinagat Islands 45 years later. 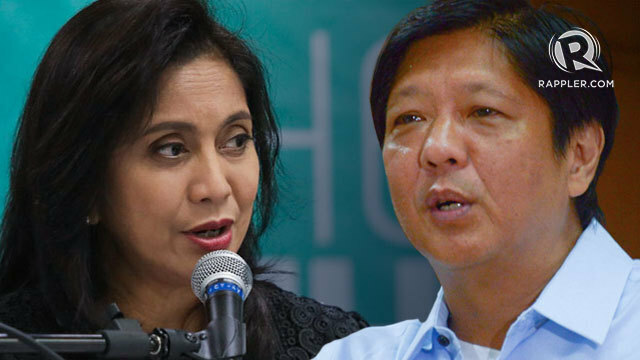 Ecleo may have transferred the power of healing to Dinagatnons, but not political power. 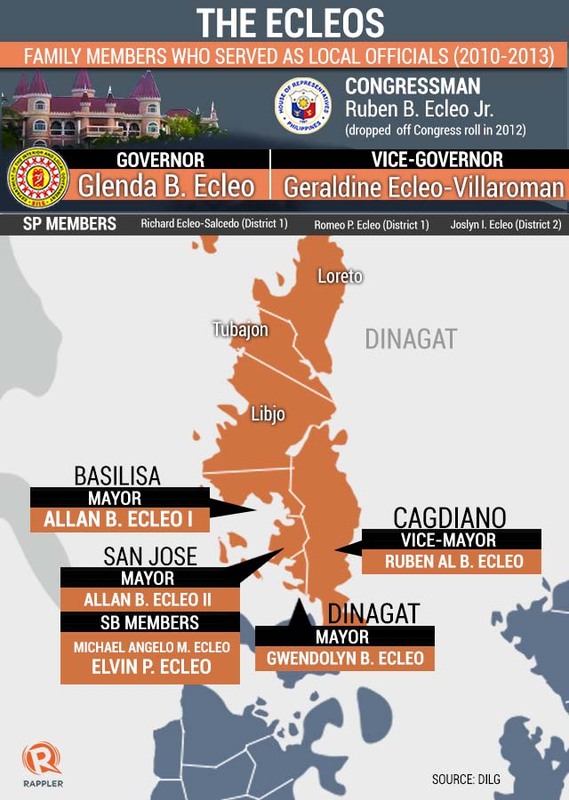 After nearly half a century, Ecleo’s wife, children, and relatives hold practically all the major elective posts in the province. Health services remain dismal; families remain poor. Widely perceived as a cult – a label dismissed by its active members – the PBMA has maintained a sizable local and international following. It has 140,000 members, according to executive vice president Benglen Ecleo, from a peak of more than 1 million when its founder was still alive. Its members make up majority of the voting population of Dinagat Islands. Residents trust PBMA missionary healers like Anacleto because they are more visible and accessible than doctors. "Wala akong pera…Mahal magpa-check-up sa doktor (I don't have money. Getting a doctor's check-up is expensive)," said Julieta Javeliano, who was once healed by Anacleto from a suspected case of cancer. She was afraid of the risk of seeing a faith healer, but felt she had no choice. It was the only health service available for free. In Dinagat Islands, there are only 3 district hospitals that service nearly 127,000 people from 7 towns and 100 barangays. The regional hospital in Surigao City, in a neighboring province, is more than an hour away by boat. About 73% of the people in Dinagat Islands live below the poverty level, according to the Department of the Interior and Local Government (DILG). In a recent visit here, DILG Secretary Mar Roxas said that "the socio-economic development of the province, one of the country’s poorest, remains a priority of the national government." Dinagat Islands is among the 5 provinces in the country with the lowest income. It is mainly dependent on its internal revenue allotment from the national government and proceeds from mining to fund its operations and the delivery of social services. ECLEO MATRIARCH. 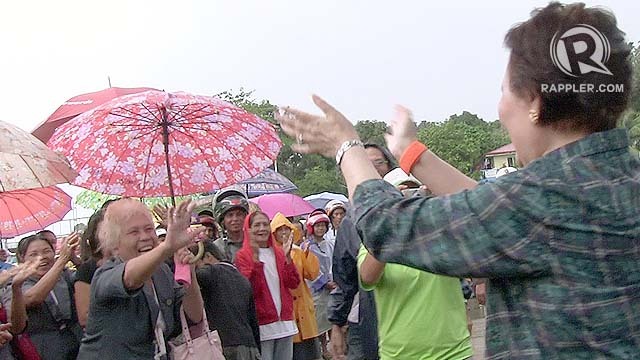 Feared and revered, Dinagat Islands Gov Glenda Ecleo nurtured a political clan that has tightened its grip on local politics. The ruling Ecleos call themselves the "good political clan." The province sits on vast deposits of chromite, nickel, and other minerals. Gov Glenda Ecleo, wife of the PBMA founder, is proud of the vibrant mining activities that, she said, not only brought development to her province but also enabled her to erect a palatial house on top of a mountain. Built in 2007, it’s called the "White Castle," which overlooks a sea of shanties and stretches of unpaved or unfinished roads and bridges. "Noong nag-boom yung chromite. I had 3 MPSAs. Doon ko yun…para bang katas ng Dinagat Islands (During the chromite mining boom, I had 3 Mineral Production Sharing Agreements. This house is a fruit of [mining in] Dinagat Islands)," Glenda said. 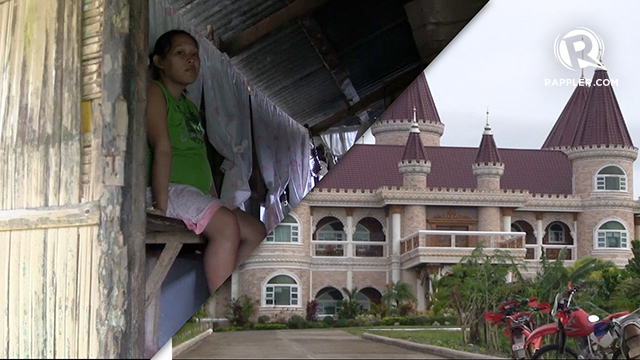 She said of the mansion that reportedly cost P350 million to build: "A castle in Europe is a fortress. Here in Dinagat, it's [just] a house. 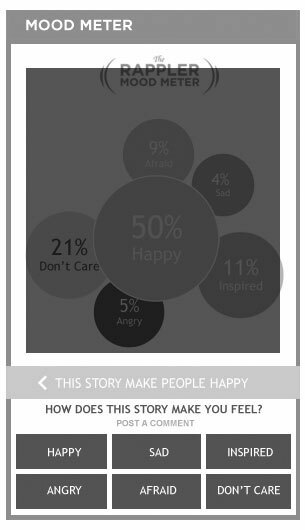 This is unique." Dinagat town mayor Gwen Ecleo, the youngest of the Ruben Sr and Glenda’s children, sees it differently. The White Castle is a monument to how Dinagatnons love and respect her parents. Some of the materials used in building the house, like wood, were donated by their constituents, Gwen said. "Ito yung nagri-represent sa pagkatao ng mga magulang ko (This represents my parents). You will see how they are really loved by their people," Gwen said. DIVINE GOVERNANCE. The Ecleos have governed based on the “divine governance” principle, which the late charismatic spiritual leader Ruben Sr introduced at PBMA. After Ruben Sr’s death, Glenda assumed a greater role in politics. She was a reluctant politician in 1980, but when she learned the ropes, the Ecleo matriarch nurtured a political clan that has only tightened its grip on the islands. Before she became governor, Glenda served as a congresswoman for 18 years. 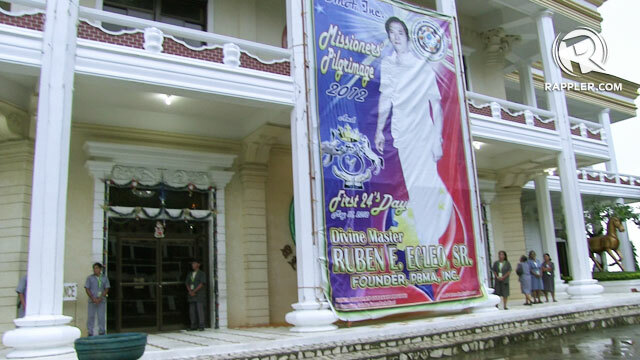 Her first son, Ruben Ecleo Jr, could not effectively govern as mayor of San Jose, Dinagat's capital town. He was not only a hesitant heir to his father's spiritual position at PBMA, but also a reluctant politician, according to some PBMA members and relatives. He reportedly preferred his love for music over politics. 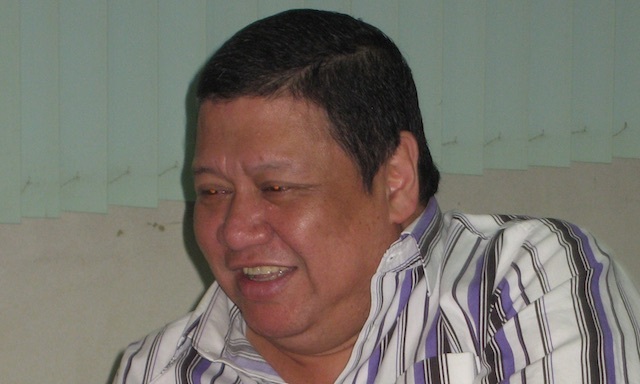 Ruben Jr nevertheless became Dinagat congressman as well, but was dropped from the congressional roster in 2012. He was convicted of parricide and corruption. The Ecleos have governed based on the “divine governance” principle, which Ruben Sr introduced at PBMA. "Divine governance is God's law, and that is: one leader, one voice. You do whatever is asked of you. It's the voice of God from heaven. For us, the voice of God is the voice of the people – as simple as that," Benglen said, explaining that PBMA members apply the principle in all aspects of their life, including politics. Both feared and revered by PBMA followers, at least 12 members of the Ecleo clan are now holding elective positions and are running in the 2013 polls. 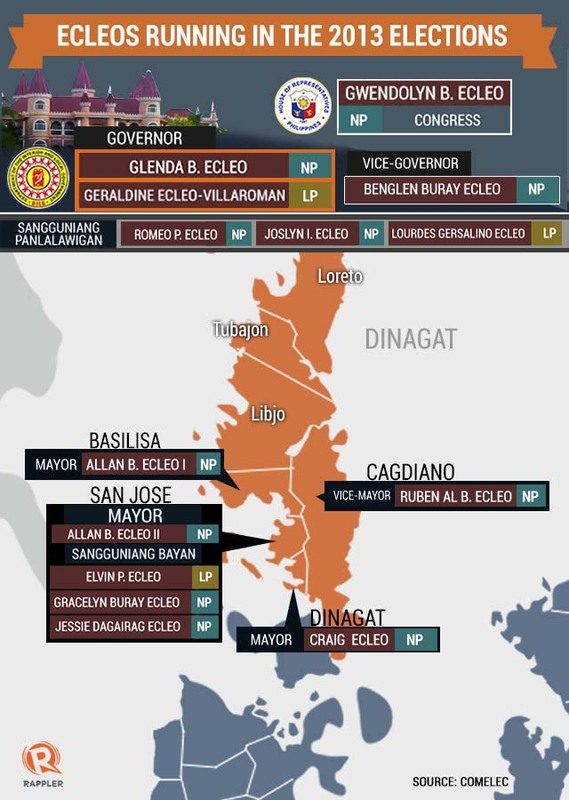 Glenda's twins – Allan I and Allan II – are mayors of Basilisa and San Jose towns, respectively. Her daughter Gwen is mayor of Dinagat town. Glenda’s other daughter, Jade, is the vice governor. Glenda is running again for governor in the 2013 polls, with Jade challenging her. Allan I and Allan II are running for re-election. Another son, top PBMA leader Benglen, is seeking to replace her sister Jade as vice governor. Gwen is eyeing Dinagat Islands' lone congressional seat once held by her older brother Ruben Jr, the "Supreme Master," who is still in hiding. Her son is seeking to replace her as mayor of Dinagat town.